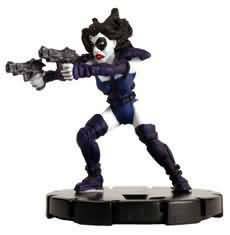 The figure used for this unit is a Heroclix figure from the Deadpool Booster set. Its name and name number are Domino/#027. 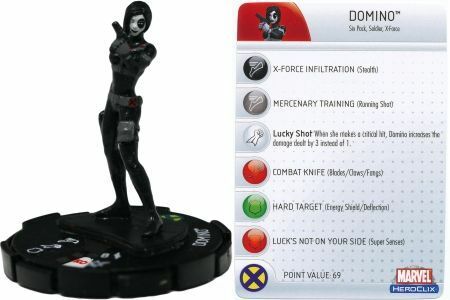 The figure used for this unit is a Heroclix figure from the Deadpool Gravity Feed set. Its name and name number are Domino/#209. 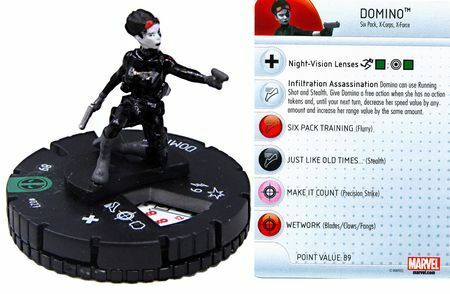 As a Mutant, Domino has these Mutant Synergies. 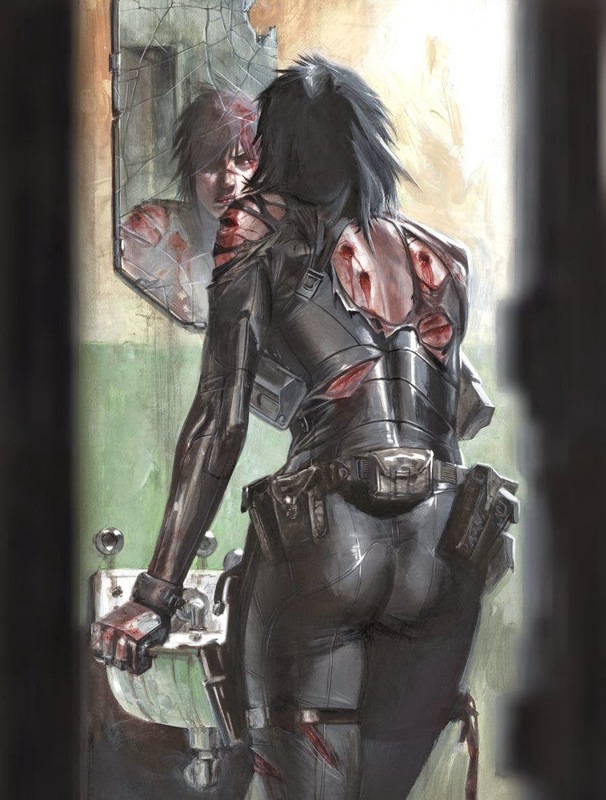 As a Mercenary, Domino has these Mercenary Synergies. 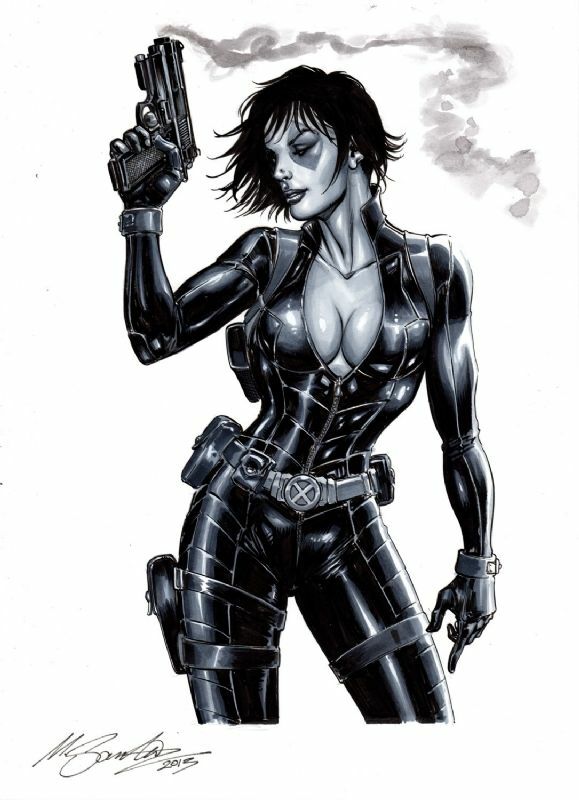 As a Mutant, Domino interacts differently with these special powers. 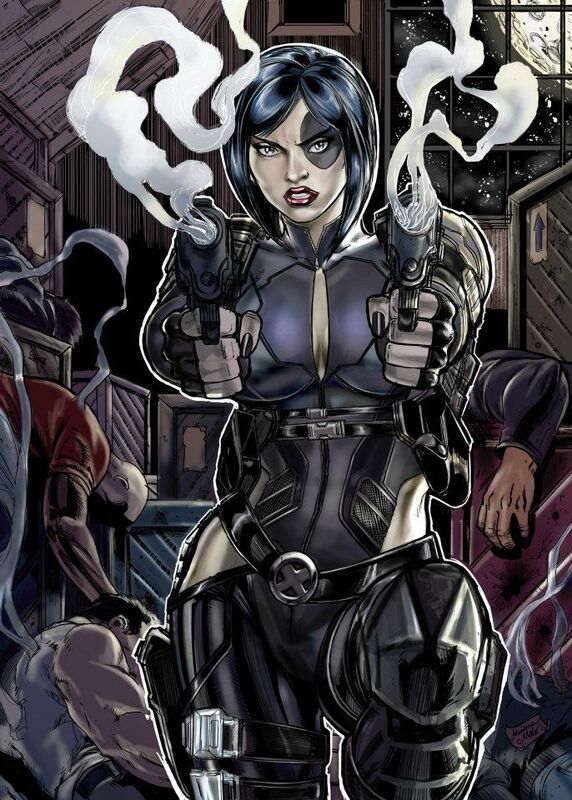 As a Tricky figure, Domino interacts differently with these special powers. 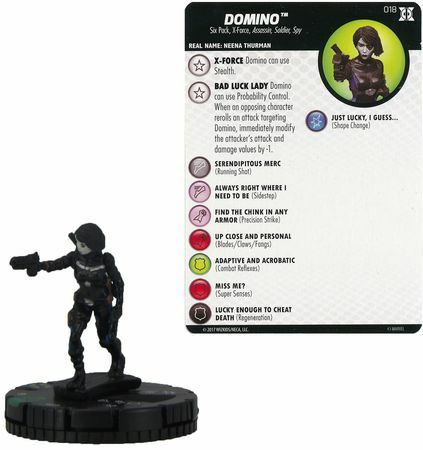 When Domino rolls attack or defense dice, she may re-roll up to 2 of the dice once. When an opponent rolls a 20-sided die for a special power or glyph that targets Domino, you may subtract 2 from the roll. 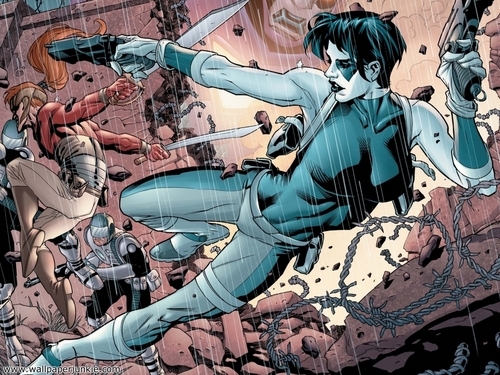 When Domino attacks an adjacent figure with a normal attack, add 1 to her Attack number. 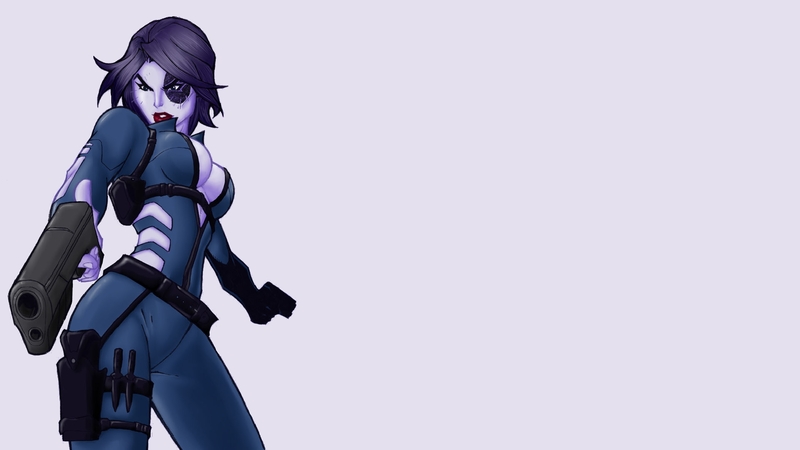 After attacking a non-adjacent figure with a normal attack, Domino may attack one additional time. After rolling defense dice, you may move Domino one space for each shield rolled. Domino does not take leaving engagement attacks when moving with Acrobatic Dodge. Last edited by Yodaking; February 26th, 2018 at 04:52 PM. We work-shopped this just recently so I think we are at a place where everyone is generally happy with the design. I'll post up some art pics soon, not sure what the background for the mini should be though. Maybe a city street or something? Speaking of mini's, since I believe there a a couple of options, anyone have a preference? I have the third one (AKA B.). It's pretty nice looking and has two guns as well. It might be a good idea to amend Combat Training to Combat Training 1. I've thought about doing a very similar power for Outlaw, but I think I'd want a +2 to Attack there. Already weighed in on this one while it was being workshopped, still dig it. Gotta keep an eye on her survivability, since she's the first-ever 4-Defense character (that I can think of, anyway) with a one-shield-blocks-all-damage effect. I know it would be quite different than the art we have used for other cards but I'm really digging B for some reason. It just speaks to me. After that I like D once you crop out most of the other people, but that one too has a different look to it than most comic art. Proportion-wise A works best...not digging B. She's known more for dodging bullets not being bullet ridden. Last edited by japes; November 18th, 2017 at 11:40 PM. Reason: auto correct...should have been dodging not "dad going"
Definitely some frightening combo potential here, with a defensive power that strongly benefits from extra dice, and an offensive power that gets some benefit as well. I see Cap and/or Star-Lord in her future. Yikes , she definitely is a little juiced. So she gets two different 'haha, screw you for trying to actually do anything' powers and like three solid attack boosting powers? Seems like a lot going on. I was really concerned about the Star Lord/CA build driving her price due to the reroll attack dice mechanic, limiting the number of rerolled attack dice to 3 was a compromise to try and keep that in check somewhat. However I never took into consideration what the defense bonus does to her 1 shield block power as well. Would further pulling back her base defense to 3 and limiting the number of rerolled attack dice to 2 be enough to not make her only playable in stat boosting builds? Or do we need to return to the SA and/or a different take on the defense power? I feel a base defense of 3 is about the highest anyone should ever get if they have 'super double-plus stealth dodge', it's a dangerous power and not one I feel is particularly fun to play against. I'm really not terribly worried about the attack side in comparison. Just a thought, but if you're looking for different takes on a defense power, why not let her re-roll attack dice and defense dice? Way less worrisome and it could make the design feel a bit more cohesive.